Each year in the January issue of Distribution Center Management, editor Jeff Ostrowski speaks with a wide range of experts to see what the New Year holds. You may read the full report below. It is also the perfect time to join us as a regular reader of Distribution Center Management. A full year of Distribution Center Management. Each month, in a quick-reading format, Distribution Center Management brings you proven strategies for managing people, materials, and costs in the warehouse and distribution center. 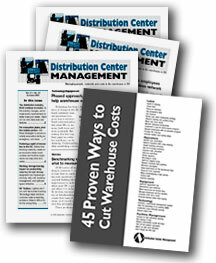 45 Proven Ways to Cut Warehouse Costs. Any one of these ideas can produce thousands of dollars in savings. When combined into an overall cost-containment program they can often reduce costs by two, three or four times that amount. 45 Proven Ways to Cut Warehouse Costs sells for $29.95, but it is free with your subscription to Distribution Center Management. Web Extras. Each issue of Distribution Center Management includes links to valuable background material, additional information, and related resources at the newsletter website.